The SWBAT identify and create related facts to 20. It's all in the family! In this lesson, students will build fact family "houses" by using 3 numbers and writing the related addition and subtraction sentences. Start by reading “The Fact Family: A Teaching Rhyme About Inverse Number Relationships” by Sandy Turley. I like to read this story because it easily relates mathematical fact families to real families. I then give each child 20 connecting cubes – use 2 different colors and give each child 10 of each (ex. 10 red & 10 blue). 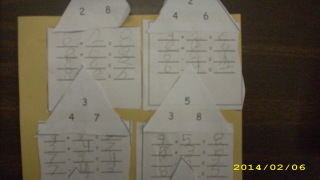 Write 4 + 5= __ on the board/chart paper. I then have the students use their connecting cubes to model how to solve the problem. Next, I write 5 + 4 = __ on the board. Again, I have the students use their connecting cubes to model how to solve the problem. 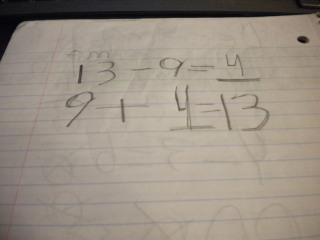 I continue this activity by writing the two related subtraction sentences on the board (9-5=__ and 9-4=__). Ask students if they notice the pattern with the math sentences. Guide the discussion to the understanding that there is a pattern between the three numbers in a fact family. 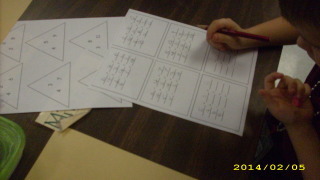 Put students in groups of 2 and have each student select a number between 1 and 10 to add. Using connecting cubes, have pairs continue model how to add the two numbers. 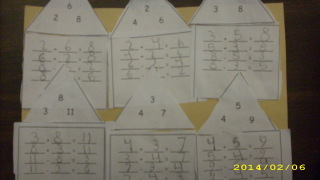 Guide them to model the subtraction facts in the same family as well. Use this same strategy and guide pairs through several fact families, walking around to make sure that they understand the concept. Have students complete the attached sheet where they build their own fact family houses. 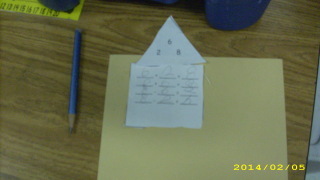 Students use the three numbers in the “roof” of the house to write the fact family. Students cut out the “roof” and the house and glue to paper. Then they write the corresponding fact families on the houses.